These beautiful scale models of the ‘Bull nose Morris’ were clearly very popular with children of all ages. The sign behind the track indicates a ‘motor museum’ which exhibited vintage motorcars and motor-cycles. Do you remember the rides or the museum? When was it there? Did you visit? Looks like mid 1960’s, I don’t remember it at all! Its on top of the Aquarium adjacent to Marine Parade, looking back towards the Old Steine. They seem to have gone to a lot of effort in construction, but I don’t think it was there for long! This one’s easy. These were on the roof of the Aquarium, between Marine Parade and Kings Road. I remember the rides, the ones pictured were on the Aquarium roof I’m sure. I think they were still there in the 80s. I remember another set of these cars at the Peter Pan’s Playground area. I can’t remember when they disappeared, but I don’t think they were there in 1979 when I had a school holiday job on the Ladybirds. I also have a vague memory of the car museum, never visited it though. I meant Marine Parade and Madeira Drive. I went on these many times when I was a kid. In fact, in the lower picture, that looks like my Mum and Dad, sister and Grandma. I may have been in one of these cars when this photo was taken. It looks like the mid sixties doesn’t it? It’s on the tip of my memory but will need more help here. The picture shows us Fortes Resturant on the right behind the cars, and this leads me to think it was after the big roundabout at the sea front, turning left as if to go towards Black Rock. I feel sure I have seen these cars myself but no real memory so far. From the clothing and ‘snappit’ rain hats I think we are talking late ’50s. Will wait curiously for more comments. 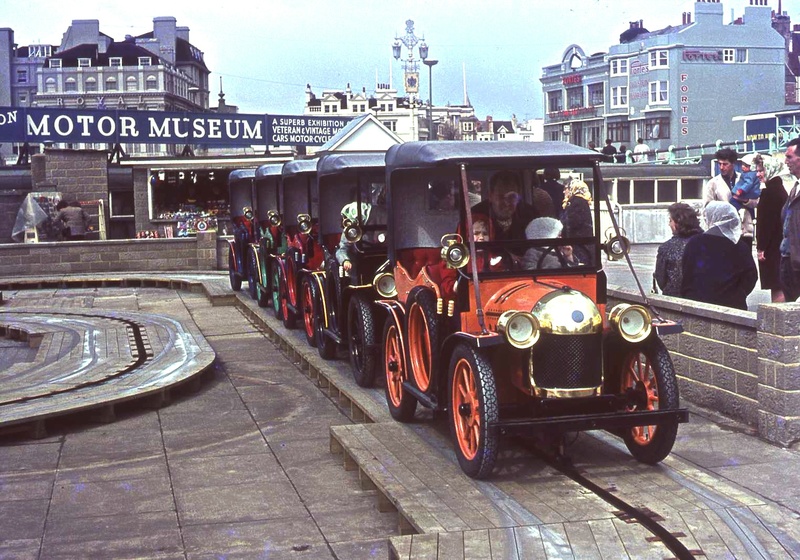 These vintage car rides were situated on the top of where the Aquarium is situated, opposite the Palace Pier. The site now is used by a restaurant and amusement arcade. The Brighton Motor Museum was opened on 17th May 1961 and comprised over 100 exhibits principally supplied by the Montagu Motor Museum at Beaulieu, but there were many vehicles loaned by other benefactors. In order to get them into the site at the aquarium a special lift had to be constructed from Madeira Drive. I have a guidebook and catalogue of the cars if anyone has a specific interest in any particular exhibit they remember. The motor museum at the Aquarium was a branch of the Montague Motor Museum of Beaulieu which is now the National Motor Museum. It occupied the Aquarium site from the begining of the 1960’s but was only there for 2 to 3 years. I visited Beaulieu in 1963, and recall that the guide booklet referred to the collection in Brighton. I arrived in Brighton in 1969. I recall that the storage units under Dukes Mound had signage referring to Motor Museum or even Montagu Motor Museum. I Don’t recall museum exhibits on the Aquarium roof, so perhaps the storage units had been vacated by 1969. This is from memory, so don’t quote me. 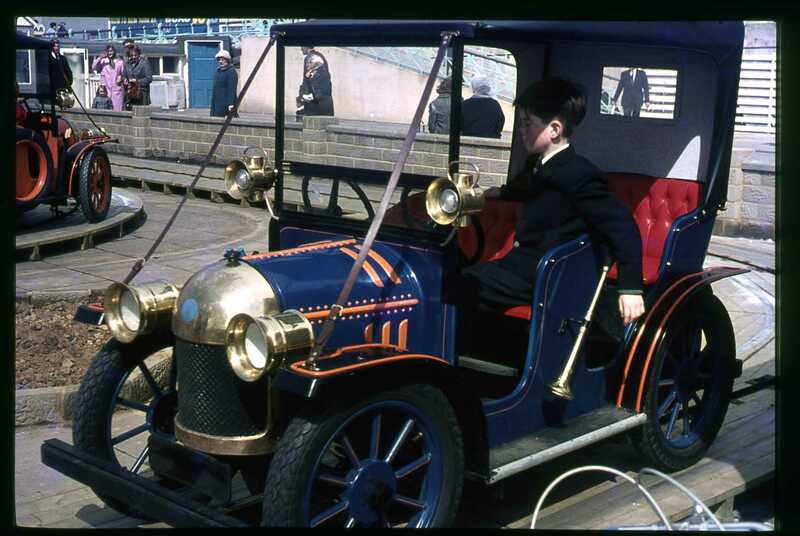 The ‘Bullnose Morris’ vintage car rides above the Aquarium were later replaced with some replica American style steam locomotives complete with warning bell that the children could ‘ding-ding’ while on the ride. The Montagu Motor Museum as it then was had the offshoot at Brighton Aquarium, The Brighton Motor Museum; The curator of this was one Michael Wilcock (F M Wilcock) who owned the Swandean Garage just to the west of Worthing. He came to prominence just after the War when he bought an ex Air Ministry Spitfire aeroplane (£250 then I think) which was parked on the forecourt of his garage and fired up on Sunday mornings. He also purchased several spare new Rolls Royce Merlin and Griffon engines (@ £25 each) one of which he installed in an enormous car that was known as ‘The Swandean Spitfire Special’ which he ran at Brighton Speed Trials in the early 1950s. I have a movie film of this car at BST when he ran the SSS against the ‘Lloyd-Jones Triangle’ another Merlin engined car, taken by my father who was a great friend of Michael’s. He had quite a collection of his own cars which were on display at the Brighton Motor Museum. After this closed Michael sold the garage and moved to Jersey where he set up the Jersey Motor Museum which he ran until he retired when all the cars and memorabilia were sold. The Swandean Spitfire Special was sold to someone in the USA where it has recently been restored. If you want to see a photo of this car do a search for ‘Swandean Spitfire’ and look especially at the Findon Village page. Michael died in Jersey in February 2008. I visited the Brighton Motor Museum in July 1966, There was a big six persons WW2 Mercedes convertible staff car exposed, captured during the Western Desert war. As I remember well, the colour was German military green. Does anyone know where this car went to after closing the museum c.q. are photographs existing? Cheers, Ton Zitman -NL. We used to call these the old crocs. It must have been the 60s to early 70s. Seeing these brings back lots of memories. I visited the motor museum in the 1960s, with my father. I still have a catalogue of exhibits dated 1961 in lovely condition, it was founded by Lord Montagu of Beaulieu and F.C.Glover. It was to be found at the aquarium. I clearly remember riding in these cars. My aunt often took me and my twin brother to this amusement arcade which was situated above the Aquarium. This was in the very early 1970s. More often than not we were given free rides as my cousin (Wendy) was (or still is – we’re not in touch) married to one of the Heal brothers who owned this arcade and also Peter Pan’s. Oh, I remember this well! I lived in Harley House Hotel opposite and used to work for Jimmy Heal in the summer months on these rides. This would have been at the start of the 60s. I remember the Heal family well and was great friends with John & Vic as well as the rest of the family. I worked the thing. There was a power speed box on copper dial, plus foot peddles inside the little hut, so I’d sit and release the cars one by one not letting them get to close & bang. They did bang. I loved working there, 14 years of age.